Here's another flavor combination I enjoy but had never seen in a chocolate bar before: lemon and poppy seed. It seems so simple, but Seed and Bean has transformed my favorite muffin into a candy bar. Their website is full of fun combinations I'd like to try. Seed and Bean is an English company, and so far I haven't seen their products in any US stores (this bar was given to me by that well-traveled coworker). 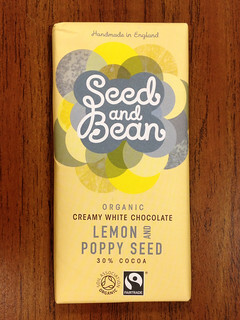 Seed and Bean's website invites you to "Experience a chocolate taste sensation in our creamy, dreamy white chocolate bar, with poppy seeds for that earthy crunch and infused with Italian lemon oil for a subtle citrus twist." I'd say they delivered. The chocolate smelled buttery with hints of lemon. 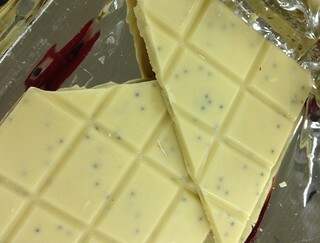 The white chocolate melted smoothly and cleanly, with a hint of natural-tasting lemon flavor. It was a subtle, creamy lemon vanilla. The only drawback for me was it was just on the edge of being too sweet - the white chocolate was about as sweet as I can handle. The poppy seeds added a fun texture - a little crunch, a little pop. I didn't get much of the earthiness the website mentioned, but the bar did remind me of muffins. It's a pretty safe bet to say that any white chocolate & lemon lover would adore this bar.